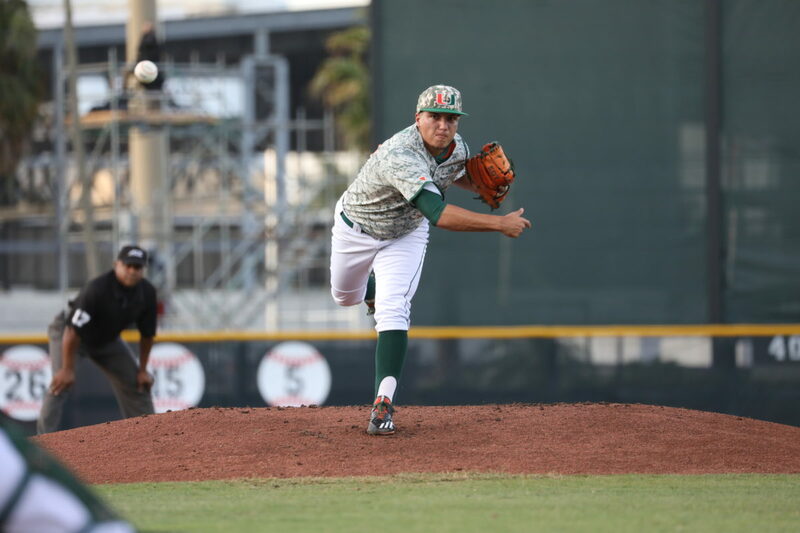 Coral Gables- The Miami Hurricanes managed to both salvage their weekend series and stave off being swept, blanking the Pittsburgh Panthers 3-0 in the second game of Saturday’s doubleheader at the Light. Andrew Cabezas (3-4 5.19 ERA) went deep, tossing a complete game and outdueling Blair Calvo (1-2 4.50 ERA) who lasted seven before being pulled. The Canes got things started at the bottom of the second with Isaac Quinones hitting a blooper over the first baseman Nick Banman for the base hit. Quinones then barely stole second, narrowly avoiding the tag with two outs and Michael Burns at the plate. On the payoff pitch, Burns hits a single to center, driving Quinones around third, sliding into home for the first run of the game. In the third inning, Panthers third baseman Liam Sabino walked and swiped second, putting a runner in scoring position with 1 out. However, Pittsburgh would find itself turned away as Miami showed off some infield moves. David Yanni popped out into shallow left thanks to an awesome catch by Romy Gonzalez, who quickly threw to second for the double play to end the inning, preserving the lead. While the infield flashed some glove, the outfield followed suit with a terrific diving catch by Hunter Tackett in the eighth, robbing Connor Perry of a single. The Canes came close to scoring again in the home half of the inning. Freddy Zamora hit a single to center followed by a perfect bunt from Willy Escala down the third base line, leaving the infield without a play. Unfortunately, the Canes went for a double steal with 1 out, resulting in Escala being caught at second despite advancing the runner to third. The Aggressive running on the base pads came back to bite Miami as Romy popped out to end the inning. Although the home team was foiled in the third, Danny Reyes lit up Calvo with a bomb to left, over the scoreboard making it 2-0 in the fourth. DANNY REYES WITH AN ABSOLUTE BLAST OVER THE SCOREBOARD! Cabezas dominated the Pittsburgh line up the entire game, holding them to just 3 hits while striking out 11. His one blemish was a wild throw in the sixth, attempting to repeatedly pick off Sabino at first. On the third attempt, the ball flew past Alex Toral allowing Sabino to make it comfortably to third with two outs. Regardless, the starter looked unphased by his mistake as he went back to work, victimizing Frank Maldonado as he struck out looking. The Hurricanes added a third insurance run in the eighth due to Pittsburgh botching a potential inning-ending double play at second, Tackett crossed the plate safely on the heads up play. With the victory UM improves to 17-22 (10-11 Conf. ), snapping a two-game losing streak. Miami lost a heartbreaker on Friday 2-1 before also losing the first game of Saturday’s doubleheader, 3-0. Pittsburgh falls to 21-16(10-11 conf.). Miami has struggled at the plate this weekend, in game 1 of the doubleheader, they stranded 10 in the 3-0 loss despite another good performance from Evan McKendry. Miami was outscored this series 5-4. Liam Sabino appeared to have broken his bat at the top of the third after fouling one off into the parking lot to left. Metal bats. Cabezas saved his cabeza, narrowly avoiding getting hit by a line drive in the seventh by Ron Washington Jr.
Cabezas threw over 120 pitches in the effort. Miami finished with three runs, six hits and one error while Pittsburgh finished with no runs, three hits and one error. Both teams stranded four runners. It’s the first CG shutout for a Canes pitcher since Thomas Woodrey on May 14, 2015 against Georgia Tech. UM will host cross-town rival FIU on Wednesday before going on a trip to the panhandle to face off against inter-state ACC rival FSU.